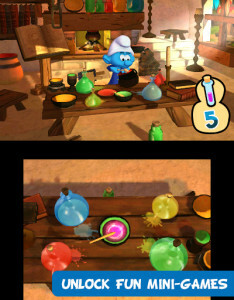 A variety of tasks are required to rebuild the village, and kids will use everything from the touchscreen to the microphone to get in the game. It's a pretty basic concept, so it may not keep older kids engaged for very long. 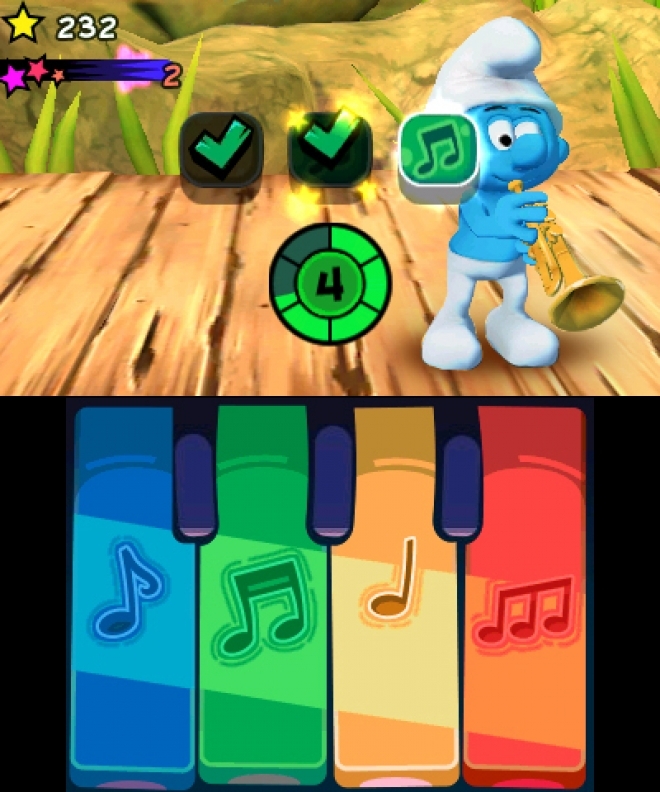 In Smurfs 3Ds, kids will find an age-appropriate adventure game that keeps them on their toes – and makes good use of several unique 3Ds features. There isn’t a whole lot of story to the game, but there’s just enough to get kids hooked. The Smurfs’ village has been destroyed, and it’s up to you to help the cute little blue guys rebuild everything – and figure out who’s responsible. To do this, you’ll need to collect and use a variety of different resources from the forest around you. The first thing you’ll learn to collect is wood. You’ll eventually need to chop down the trees, collect the wood, and hammer in nails, and you’ll do this all with a series of mini games that progress in difficulty, but never get too hard for even young players. To chop down the trees, you’ll tap on the weak spots, then slice across the screen to chop logs into boards, and finally tap on nails as they move down a scrolling screen. There are mini games for the other resources in the game as well, ranging from a tetris like game to build with stone, to mixing up ingredients to bake a cake. All of the mini games can be played and practiced as many times as you like, but you’ll only collect resources for playing them if you’re at their location on the game (for instance, stones at the mine), so there isn’t a lot of motivation to do so – after all, you’ll need resources to continue building your village, so you might as well be collecting them while you play. Though the game is fairly linear, players do have some freedom as to the order they rebuild things. You won’t be able build anything with stone until you’ve discovered the mine, for instance, but you can choose to build features around the village before progressing with the story. 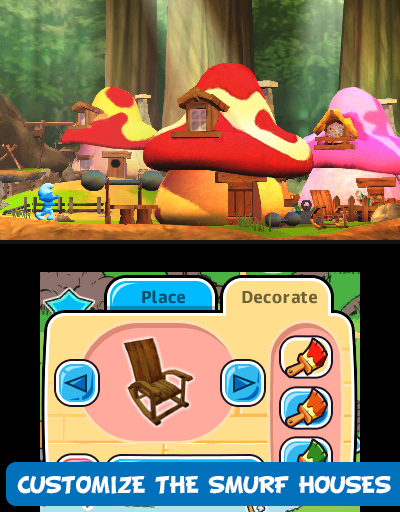 You can also do some limited decorating in places you’ve already built, if that’s something you enjoy. The Smurfs 3Ds offers some fun, age appropriate resource management for the young gamers in your household. The Smurfs in this game are the old school comic version, not the cgi smurfs of the more recent movies. 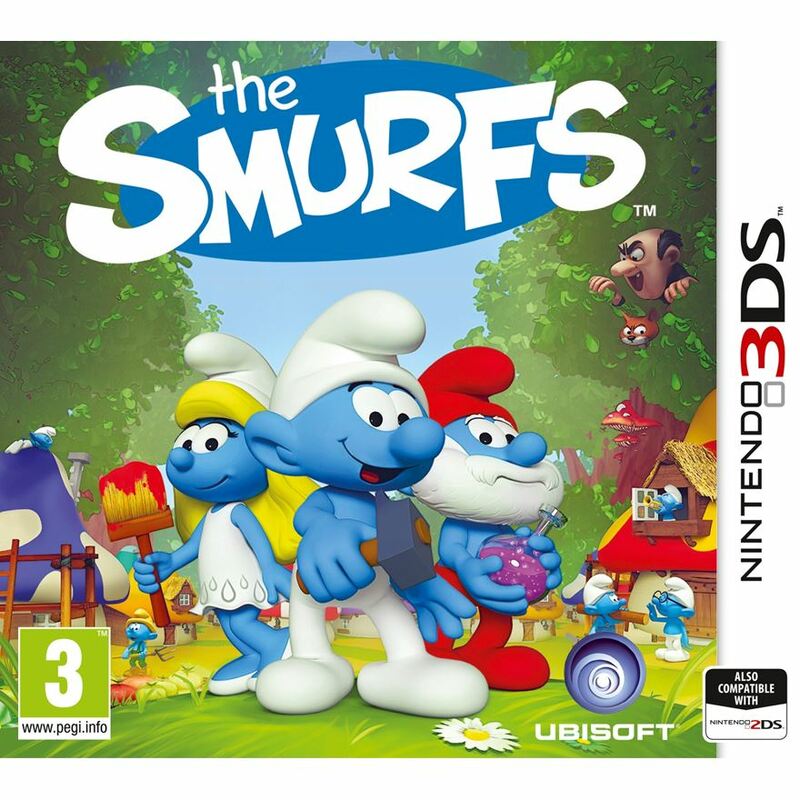 This is the Papa Smurf and his smurfin’ buddies you remember from your childhood, and it’s great to be able to share them with a new generation of kids. Though the game isn’t all that involved, and the story line is pretty basic, it offers young gamers fun tasks that they can master in a variety of ways, and they’ll no doubt be thrilled to find it under the tree this holiday season.